It's wintertime in Chuggington and the Chuggers are busy making preparations for the Parade of Lights Festival, adorning themselves in glowing colored lights for a special procession through Chuggington! But, when freezing fog traps Koko and a snowy avalanche derails Fletch, that’s when Wilson and the Chug Patrol team must set out on a wild winter rescue! This action-packed collection features five Chuggington specials, including the all-new Snow Rescue Special. With added bonuses including new character montages and coloring sheets, your own little Chugger will discover important lessons about safety, responsibility and teamwork. My son loves trains. He's loved them since before he could walk, so Chuggington has been one of his favorite shows for years now. We love the characters and the theme song is just catchy. I'm actually singing it right now, lol. Snow Rescue is out just in time for the holidays. 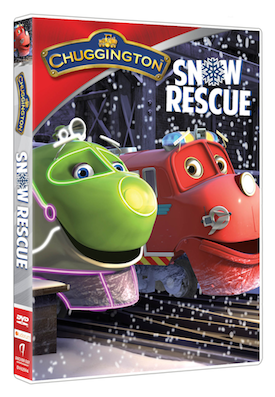 This DVD comes with the new Snow Rescue Special along with four other episodes that your kid can enjoy. In the Snow Rescue episode we see our favorite trains get ready for the holidays, but a snow avalanche and freezing fog happens and the team is on a mission to save Koko and Fletch. Such a great episode that teaches your kids about teamwork, safety and responsibility These are shows that I don't mind my kids watching over and over again. Knowing that there is a lesson behind each episode that your child can learn and take with them to school to help them with their friends and classmates is a show worth watching many times. Snow Rescue is now out on DVD retailing at $14.95, this is definitely a great gift to give your little Chugger this holiday season. Be sure to download both these awesome recipes and holiday activity sheets for your little Chugger! Disclosure: All opinions are my own. I received Chuggington: Snow Rescue on DVD at no cost for the purpose of this review. No other compensation was received.